ALL IN CONTEST: iPhone 5. Mula-mula nak baca ni dulu, tentang iPhone 5. Agaknya kalau kawan-kawan yang dah guna iPhone 3 atau iPhone 4.. Kawan-kawan nak tukar ke iPhone5 tak nanti?.. 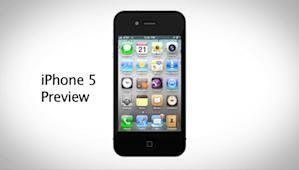 Last year's model, the iPhone 4, had a glass backplate that could get scratched. It's possible that the iPhone 5 will have a brushed metal backplate, which would help keep it from scratching and make the phone lighter as well. There have been some recent rumors that the phone could get considerably thinner, even tapering toward the bottom. The square edges could round out, making it look a little more like an iPod touch. Besides that, we've heard that Steve Jobs isn't a fan of physical buttons; the iPhone 4 only has one, on its front. The iPhone 5 might turn that one physical home button into a virtual, on-screen home button, which would get out of the way while you're watching videos. This would give it a four-inch screen, half an inch bigger than the iPhone 4's. But another rumor has the display bumping up to only a 3.7-inch screen, and the home button getting slightly larger. Remember, none of this info is coming from Apple. It's all rumor, speculation and guessing, so take it with a grain of salt. What performance upgrades will it have? It'll have a faster, probably dual-core processor, plus more memory and an improved camera -- one that might be able to take 8 megapixel still pictures and record 1080p HD video. You'll be able to play more realistic games, switch between open apps more quickly, and keep more web pages open at once. Beyond that, you can bet that Apple doesn't want a repeat of "Antennagate," and will be paying special attention to the iPhone 5's antenna to make sure there are fewer connection issues. Will it have any new features? We already know what features the iPhone 5 won't have: A removable battery, a memory card slot, and support for Adobe Flash videos. These features are commonly seen on other phones, but are not what customers expect from Apple products. One feature that Apple recently filed a patent on is being called a "Smart Bezel" by rumor sites. These are areas just outside the screen that can light up and are touch sensitive. They could be game controls or battery indicators, or let you use new finger-swipe gestures to control your iPhone! Another feature they might add is called NFC, or Near-Field Communication. This is a technology that would let you pay for things by waving your iPhone near a sensor, sort of like what some 'wave-to-pay' credit cards can do today. NFC is already in widespread use in Japan, and is being tested in the United States. Apple may decide to hold off on it, though, until people are more comfortable using their phones to make payments. One other possibility is that the iPhone 5 will get induction charging. That's where you plug in a separate charging pad, and your iPhone recharges just by touching it.